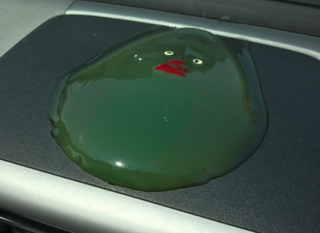 The initial tweet, posted yesterday and already garnering close to 500,000 retweets, depicts a small green duck succumbing to the heat and becoming the flat-faced avatar of humid summer doldrums. It reads “This is the worst, I can’t believe it.” But take a look at those two photos again. The radio looks the same. The duck and duck puddle are the same colour. But doesn’t the top of the dashboard look... different? “To all those who are saying the two pictures are showing different objects, look at this. I think (3) is a vertical angle. Please check my work,” user @saw_spla replied, mocking up a hand-drawn multi-angle interior of the That’s, complete with a colour key. Obviously a ploy by the anti-Putin opposition to corrupt the Russian youth. He'd spent two hours slipping notes to customers before someone took him seriously.